Larry loves New York (and New Jersey)! 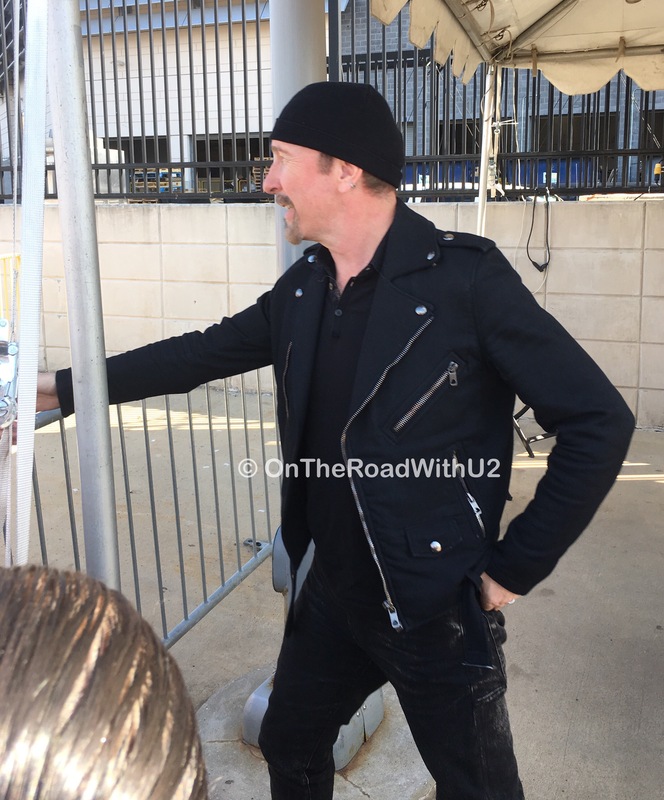 He and the rest of U2 seemed to be having a lot of fun last night at MetLife Stadium. It was a great show with the same set list as the previous show in Boston. 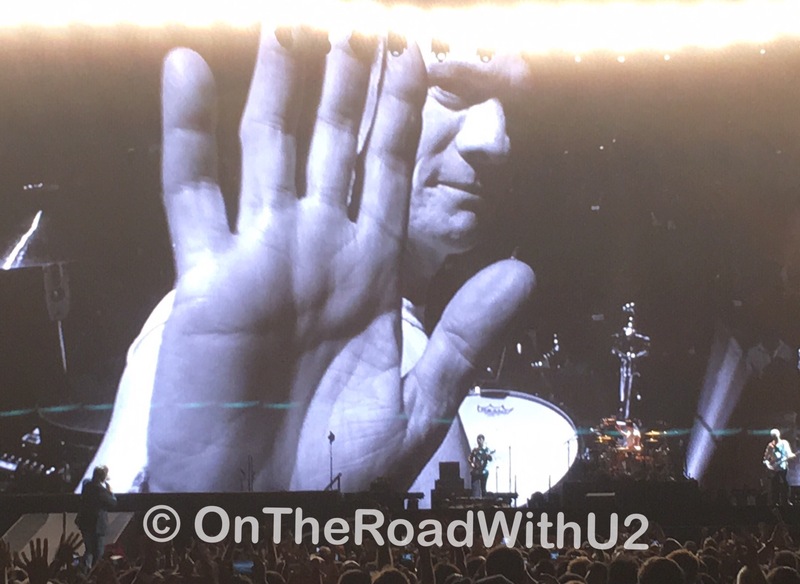 This was the start of my five day, 1000 mile, six state, 4 concert road trip to end this first US leg of the 30th Anniversary Joshua Tree Tour – my 98th, 99th and 100th U2 shows! I left Maryland just before 9am Wednesday and after a bit of traffic in Delaware, I pulled into the Extended Stay Hotel across from MetLife Stadium at 12:30. I ordered some yummy NY pizza, unpacked, rested (actually napped) until 4pm. While waiting for my Lyft, I saw my old friends Ayaz and Kim pull into the hotel. By 4:15, I was at MetLife Stadium waiting for U2 to arrive. I saw the folks from Dream Out Loud and Vicky and Romona. 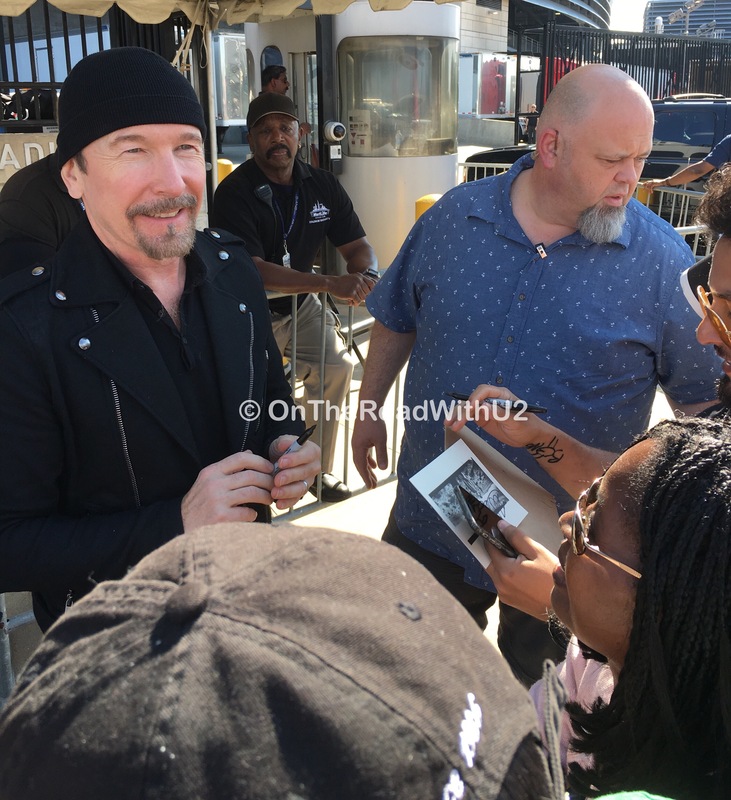 At 4:40 Edge drove in then walked out to greet us, sign autographs and take photos – even though we were instructed he would only shake hands. I tried to thank him for this Joshua Tree tour, but I dont think he heard me. He did respond to someone else saying they are having a LOT of fun right now! 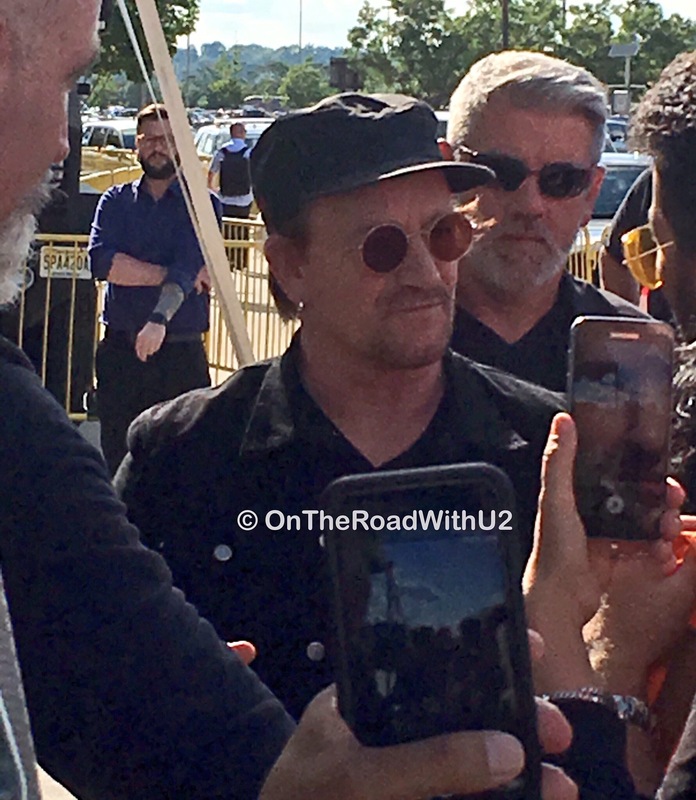 Bono drove in around 5:15 and once Brian assessed the crowd, Bono walked out to greet us. He was right in front of me but the guy next screamed and got his attention before I had a chance to say anything – and then he was gone. By 6pm I was leaning on the left rail of the soundboard (after going to the bathroom and getting a Gatorade – in a cup with a lid and a straw!). It was great to finally have a bathroom and concessions on the field level and not have to climb upstairs. I finally got to see a lot of old friends last night: Abbey, Michelle, Alice, Rick, Brendan, Drew and Brad. I stood at the soundboard with Vicky and Romona. At 7:18 The Lumineers too the stage and played until 8:10 – I went to the bathroom. The GA didn’t really start filling up until 8:30 or after. Sadly Dennis Bell and some members of the New Voices of Freedom were in RedZone rather than the soundboard, so I didn’t get a chance to meet them. 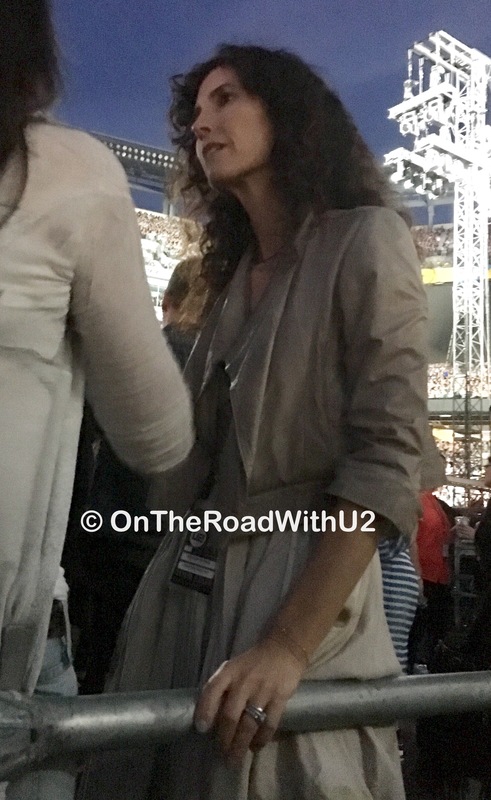 But I did see Edge’s wife Morleigh and actresses Gina Gershon and Carrie Lowell at the soundboard. Carrie was my favorite assistant DA on Law and Order (she was on the seasons with Benjamin Bratt). Gina Gershon was really enjoying the show – taking pics and vids and singing along. U2 took the stage at 9:25 and played until about 11:30. Larry strutted out in his usual black tee and black pants and no one saw him at first. I of course started squealing and jumping up and down. It was great to have a front view of the Tree stage for once and the soundboard was surprisingly close – I had a straight shot of Larry’s drums. 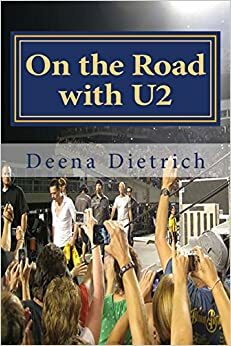 During “Trip Through Your Wires,” I watched Moreleigh watch herself on the video screen and her reactions to Bono talking about her. She was smiling and laughing the entire time – it was very endearing. 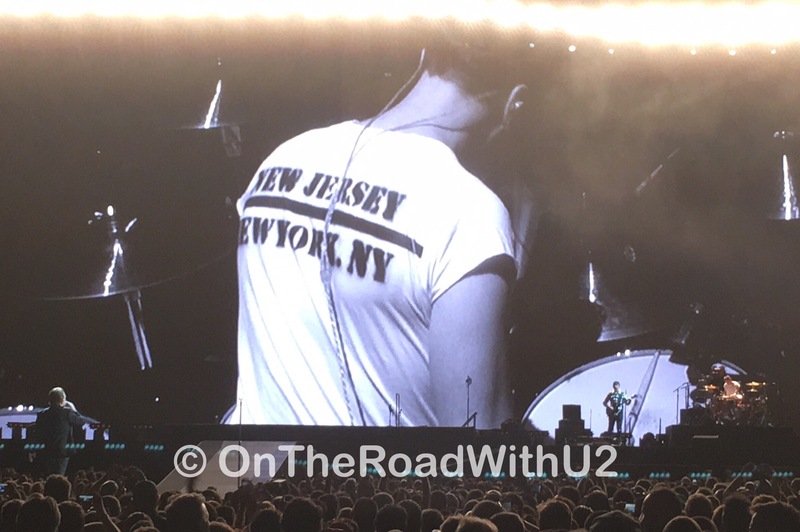 Larry changed into his white tee for the the encore, but this time it said New Jersey / New York on the back. 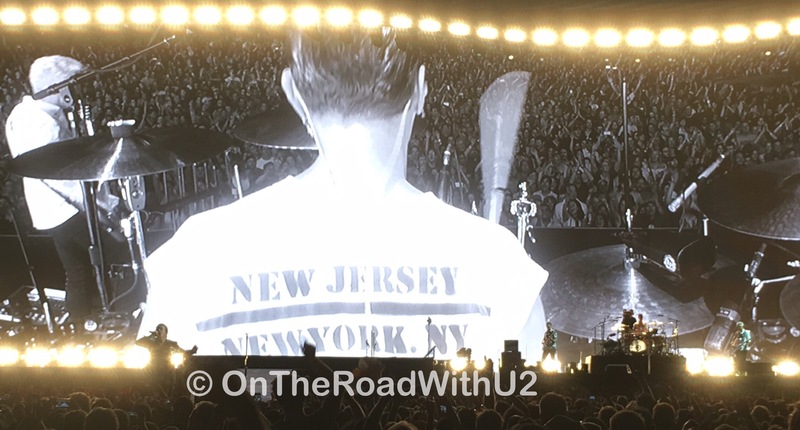 We saw it during his “Elevation” cam when he smiled and waved as Bono asked, “Who in here believes in Larry Mullen Jr? He gave us our first job, our only job.” During “Vertigo,” Bono added “it’s only rock n roll” and “rebel, rebel” snippets. After the show. I walked as quickly as I could to lot D to meet my Lyft I had preordered. He couldn’t get to the stadium because of the traffic, so they kept sending me new ones. For 20 minutes I waited but nothing. Finally I saw a man with a sign saying Hilton Shuttle. There were five shuttles going back to the hotel, which is right next to mine – and it was only $8. I don’t know how got off the lot so quickly, but we were back at the Hilton in 15 minutes. Then I walked next door to my hotel. I was in my room by 12:10. I’ll do the same thing tonight. Warning: Uber / Lyft from MetLife Stadium DOES NOT work! My plan for Jersey2 tonight is a carbon copy of yesterday, but I am expecting at least a couple changes in the set list.